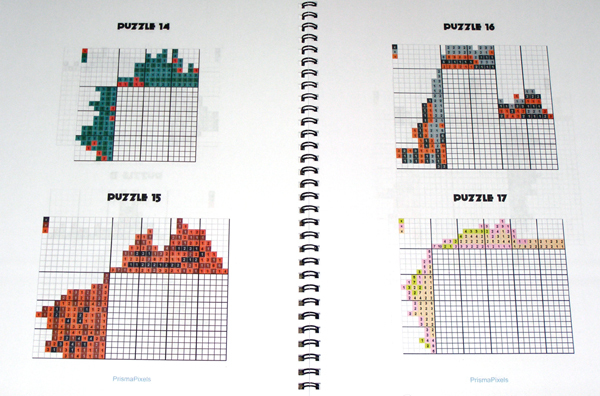 The book is arranged by number of colors, low to high, and the puzzles shown in this photo are from the 3-color section. Here is a sample section from near the beginning of the book. The earlier puzzles are generally smaller, ranging from 15x15 puzzles to 25x30 or so, but many are larger, even up to a 40x45 and a 30x50. Later in the book there are as many as 6, 7, and even a 10-color puzzle. Each puzzle, when solved, results in a recognizable picture, so it's fairly easy to tell if you did it right!